Today marks the one year anniversary of my Epic Romeo and Juliet Project. I think of this project often and I have watched the movie the students completed a few times since the premiere. It is still the best project I have ever worked on and couldn't be prouder of the impact it has had on my students. I love the fact that I will be able to see these students grow up and we will always have this project to share. It something special that my students and I will share and that makes me smile. The title of the post is a quote from the Friar as he advises Romeo. It is something that sticks out to me when I think about the planning that went in to this project and other projects. It is solid advice for all teachers planning on creating their dream lesson. Like I said at the end of the project, I encourage all of you out there to go after your dream project and make it happen. Well, I finally did it. Vanity got the best of me and I finally recorded a conversation with a friend to share with all of you. I thought it would be a good time and I hope people like it. In the future, they will not be as long and will be a bit more focused, but I had so much fun chatting with my buddy Tim. The next #NerdyCast will feature the amazing Lyn Hilt. She is one of the coolest people I know and I'm excited to have her on the show. Today, Adobe announced Adobe Photoshop CS6 beta, a preview of the highly anticipated upcoming version of the industry-leading digital imaging tool. Please help us spread the news by posting about the availability & encouraging downloads. Additionally, we'd love for you to play around with it & share your thoughts on these new features & enhancements. Photoshop CS6 Beta is available immediately as a free download on Adobe Labs (http://www.adobe.com/go/photoshopcs6) for Mac OS and Windows – in English and Japanese. At installation, users will be required to provide an Adobe ID to complete a one-time login and online product activation. Beta users can submit feedback via the Photoshop CS6 beta forum (http://www.adobe.com/go/pscs6_forum). A few months ago, I was asked by a faculty member at the Fashion Institute of Technology (FIT) to be on a panel to talk about Cloud Computing for the EdTechDay Conference. I am really the last person that should be allowed anywhere near FIT. The only thing I have going for me in the fashion realm is that my clothes will eventually come back in style and will be considered vintage. Having said that, this is not my first adventure in the world of high fashion. Please look at this picture from my Senior year high school fashion show as proof. I was pleasantly surprised to see that Kristen Swanson was going to be on the panel with me. I've known Kristen for a little while through conferences and Twitter, so I was excited to sit and chat with her. Here is a break down of the panel and the description of the session. Three things stood out to me while in NYC. As I looked over the different sessions, I was very interested in seeing what a dance professor from Buffalo was doing with the cloud in his classes. Professor Carlos Jones was a great presenter. I sat in a room with other arts teachers who wanted to know how technology could be leveraged in their classes. We were not let down. Professor Jones utilized Youtube and Voicethread in his classes. He has students record their dance moves, upload them to Voicethread and he would critique their work. It was actually a fairly simple process. Professor Jones also emphasized that he is not a tech expert. He only learned about these tools in May and had just started to work with them in his Fall classes. You couldn't tell from the work he shared with us. His students, not all dance majors, were engaged in the projects and excited to show off their dance moves. A fairly athletic young man cleared his dorm room and did some ballet in front of a camera to be shared with the professor. It seemed so natural for him. The thing that struck me most about this session was the fact that the professor kept saying the term "flip" without ever talking about the flipped classroom. He had created a flipped classroom in his college dance class without ever being taught about the flipped classroom. This stuck out to me because some people are so intent on teaching a term, that the process can get lost in the shuffle. While many people might now what the cloud is, many people use it on a regular basis without realizing it. This thought is going to change the way I approach teaching teachers. The name doesn't matter. I need to focus on the process. This was an excellent class and a great example of how technology can be embedded into the Arts. After the opening Keynote, Kristen and I decided to grab a snack before heading to our first session. We found a Panera close by and grabbed a booth and started chatting. Like I said, Kristen and I know each other, but have never really had a chance to sit and talk. I'm very glad we had the chance. We talked all things tech and education and I learned about the NY Public School System and her job working with teachers. We shared similar stories of IT frustration how teachers in different states react the same way to frustration. I also had a chance to pick her brain regarding her time as a Director of Technology. I have not been secret about my desire to take a position like this and have had offers to consider. It is just great to here what other people have done and the issues they have faced in that position. I respect the work Kristen does and her opinion was very helpful as I move closer to a decision. Kristen and I joked about how some people, outside of ed tech, will just not understand how two people can talk for an hour about ed tech. Those in the know, know. The panel had some diverse viewpoints. Kristen and I were the only two of the five that were actually involved in education. The other three were Mark Burke – CEO viaEdTechnologies, Jay Chakrapani – Vice President Digital Products McGraw Hill Higher Ed. and Andrew Cohen – CEO Brain Scape. Putting educators on a panel with non-educators can be a very bad situation. There were times when Kristen and I both reached for the mic in response to some, lets just say "interesting", responses from the business world. I think their is a time and place for business to talk about how their product can help revolutionize the educational world. However, I feel that an audience of professors would much rather hear from teachers who get their hands dirty with the cloud. This was evident from the questions asked by the audience. It was a fun hour of conversation moderated by the thickest French accent I have ever heard in person. The entire day was exciting and blog inspiring. I have another post I still need to work on concept of branding. Alice Marwick gave an interesting Keynote that really made me think about educational bloggers and the way we brand ourselves both knowingly and unknowingly. I want to thank all of you for being a member of the Rebel Alliance. Wait, you didn't know you signed up? Fun Fact: If you read closely, it's part of the Twitter Terms of Service. It actually trumps your membership in the Galactic Empire found in the iTunes Terms. By joining Twitter and being part of my PLN, you are part of a very specific group that is fed up with the way that education is being run day by day. YOU want change and ready to reach out to anyone who also wants change. You don't care if they live in the same city, state or star system. You are prepared to help other rebels become better at what they do every day. Some of these rebels work with Wookies, Tusken Raiders and even Hutts, but it doesn't matter to you because you are ready to share with anyone willing to reach out. 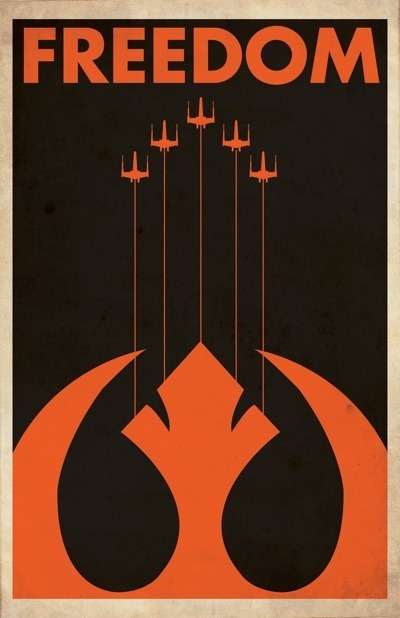 This Rebel Alliance id much stronger than you think. We are growing in numbers every single day and people are taking notice. For every Tweet and ReTweet, we grow stronger. Every time you blog your displeasure with the status quo, it is a slap in the Empire's face. One slap alone might not get get the notice of the bloated Empire, but thousands of slaps from the Alliance will make them take note of who we are and what we are doing. I want you to know that you are not alone. Strive to change the world in which you work. Every rebel is ready to come to your aid at a moment's notice, so do not fear change. Keep your head up and continue to work hard. Make the world around you best for everyone there and set an example to the rest of the universe on how things should be run. As Lea said to Tarken, "The more you tighten your grip, Tarkin, the more star systems will slip through your fingers." This is as true today as it was a long, long time ago. The Rebels are not going anywhere and we are continuing to make an impact despite the best efforts of the Empire to break our will. As we move forward, your main mission is to spread the word. We can only win this assault against education by growing our numbers. The Empire has the resources to continue this fight, but we have the passion. The passion for change will always outlive the bureaucracy of the Empire. Thanks again for your commitment to the cause. Although I cannot promise you this is an easy cause to fight for, I do promise you a nobel one. I'm super excited for my state tech conference (MACUL) this week. Starting Monday, I'll be surrounded by some of the best and brightest Michigan has to offer in the way of educators in technology. I love flipping through the conference book and circling all of the sessions I want to go to, knowing there are not enough hours in the day to do so. It's funny for me to think that I have been to more ISTE conventions than I have MACULs. I entered the edtech game late and the state conference was not on my radar. Everyone on Twitter was talking about ISTE and that was my only focus. I'm bummed that I didn't attend more MACULs. I really could have learned so much from so many diverse teachers from around this great Mitten. I have seen that other states have had their conferences and have followed the tweets to catch nuggets of edtech gold. I hope all of you will follow the #MACUL12 tag (Click the link to see the feed) and mine for your own bits of info. I decided not to present this year because I really wanted to not worry about presentations and focus on going to sessions and learning from others. I will be on a panel with some great friends talking about the many uses of technology in the classroom. I cannot wait to meet some great friends, share some awesome ideas and have a great time in Grand Rapids. See all you of there! Adobe Photoshop Touch for iOS is finally here and I couldn't be happier. At $9.99 ($4.99 for Educational Volume Purchasing) I think this is a great deal. I'm not the handiest when it comes to Photoshop. I can do some photo editing and some silly stuff, but nothing compared to what some of my friends are capable of doing. I was a bit hesitant in downloading the 10 buck app, but I was not disappointed. The tutorials in the app are simply amazing. They walked me through the various things I can do on Photoshop and where all of the correct buttons could be found to make the editing process smooth. I can go back at any time and review the tutorial if I get a little lost. I was able to take pictures and layer images and write on top of them. I felt like I could do everything I would normally do on my Mac. It's great. As for using it as part of my iPad pilot, I'm not sure it is the right fit for me as an American Literature teacher. It would be simply amazing in Art Classes though. I have some amazing art work from students that just like to doodle while taking notes and participating in discussion. I know if they had access to this app in class, they could create masterpieces. Below you will find some screen shots of what the app looks like and what it can do. While not all of use are masters with Photoshop, Photoshop Touch is a great app that allows the most remedial of users to express themselves with creative flair. If you are a Nerdy Art person, this is an app that you have to have on your iPad without question. The pressure on educators to rethink strategies for integrating technology into learning is greater than ever, and with good reason. Technology is pervasive. Finding ways to align students’ interests and enthusiasm for technology with the realities they will face in college and the workplace is essential. While technology in education has been on the minds of educators and students for decades, keeping and teaching relevant technology in the classroom remains a challenge. What’s top of mind for teachers and students today, such as the 1:1 laptop initiative, was unheard of just a few years ago. Conversely, what’s considered essential today may be outdated tomorrow –remember the Palm® Pilot? The good news is that fresh new approaches to Career and Technical Education (CTE) are taking shape at school districts across the U.S. With dropout rates hovering at or above 50% in many of the largest U.S. school districts, CTE programs can make a critical difference, helping students stay engaged in school while mastering 21st century skills. Educators have moved from teaching students basic computer skills to using industry-standard software to improve student creativity, strengthen problem-solving skills, and foster better collaboration in team environments. Increasingly, school districts are standardizing on industry-leading software so students learn using current workplace solutions. Consider the compelling proof in a study of Florida’s Career and Professional Education (CAPE) academies: after five years, the graduation rate rose from 71% to 88.3% among students enrolled in their programs. At the same time, these students graduated with a significantly higher GPA. The average GPA among CAPE students earning industry certification is 3.0, compared to the overall Florida average of 2.5. For Armstrong, one critical way to make technology in education relevant to students is giving them access to the same software they’ll need to be successful in the workplace. For example, he’s using a combination of the latest computer hardware and Adobe® Creative Suite® Design Premium in order to develop the design, illustration, and composition skills that will serve his students well in an increasingly digital, visually-driven world. The School District of Brevard County, in Florida, highlights the potential of CTE to transform student opportunities and learning. Several years ago, educators on Florida’s “Space Coast” set out to create a program to prepare high school students to excel in an information and technology‐centric society, providing them with essential digital arts and communications skills. At Viera High School in Brevard County, digital arts and media instructor Pete Espicopo helped develop a digital design and multimedia curriculum and academy that aligned with standards set by the International Society for Technology in Education (ISTE) and National Educational Technology Standards (NETS). The curriculum is designed to help students use industry standard Adobe Creative Suite software to learn the skills and competencies now in demand by industry and postsecondary education. In this program, students learn in small teams; gain practical experience through industry‐sponsored internships; and operate in an industry‐like environment. Most importantly, students use the same equipment and software used by industry professionals, and have the opportunity to attain Adobe Certified Associate credentials that are recognized as entry‐level industry certification. With today’s economic climate and rapid technological advances, the need for CTE courses is greater than ever. CTE programs provide students with a jump-start to their college degrees by providing advanced credit for courses taken in high school. Additionally, students gain the range of skills necessary to be considered “workforce ready.” Savvy educators are embracing the challenge of keeping technology relevant in learning, with CTE programs built to reflect the reality of the changing workplace and designed to give students ways to explore career options, build transferable skills, and access multiple paths to success.